People born specifically on the 12th of November are anticipated to be self reliant and lighthearted with an inquiring mind but not as serious as most other Scorpio's. The ruling astrological planet for this particular day is Jupiter making you naturally intelligent, highly perceptive and loyal. If you have this birthday your firmness regarding beliefs and values may make you a little stubborn but you will always be quite open to new ideas. You possess an energetic practical approach to life coupled with lots of determination and stamina but you can be a bit of a perfectionist at times too. Charismatic yet a bit of a loner you are rather independent and great at predicting the thoughts and motives of others but also a tad insecure emotionally. Individuals with a November the twelfth birthday are full of integrity and innovative thought along with an enthusiastic forward looking attitude. With your fondness of a challenge and a keen eye for detail you are usually easily bored by mundane routine and prone to temperamental moods. An aim to be successful in their chosen career and an eagerness to show off their many talents is important to a person born on the twelfth of November. You are ambitious and will require work that provides the chance of progression so dull, simple jobs are not really suitable for you. Your mix of strong and soft makes you adept in managerial type positions or ideal for an occupation that involves taking balanced quick decisions. You tend to be sometimes impulsively careless with money despite wishing to try and save. It is often commonly difficult for you to begin putting finances aside for the future without some added incentive or encouragement. For a Scorpio, the person born on the twelfth day of November is typically a seeker of emotional happiness who will put a lot into a personal relationship. You are inclined to be generally lucky in romance and when it comes to meeting your destined soul mate. Your charming thoughtful intensity makes you loveable and honorable with a tendency to love unconditionally. Your sensitive emotions guide you to be untypically magnanimous in spite of your proneness to be deeply hurt by unfaithfulness in loving relationships. It could be hard to gain your trust initially but once you commit to a long term partnership you do so with complete devotion. A partner should be able to cope with your touch of sarcasm and inclination to tease in harmless humorous ways. Between the sheets you are just as passionate and imaginative as all typical Scorpions but often not as sexually needy. Staying as happy as possible can be highly beneficial to the usual good health experienced by those born on November 12th. Although you seem to take care of yourself adequately you could need the extra motivation of an emotional or spiritual sense to help retain your healthiness. Unhappiness can prompt comfort eating or drinking and you are not particularly interested in exercise but should find it useful to relieve tension and clear your head. People born on this day should discover that ensuring they get a regular good nights sleep will always be the best method to rejuvenate and boost body and mind energies. Your main strengths of character are seen in your unique combination of self reliance, inquisitiveness, intelligence and perception. These positive traits give you ample qualities to take advantage of any fortunate opportunities presented to you. Your enhanced practicality and penchant for firm principles are further fortes that enable you to go far in life. The personality weaknesses for those born on November 12th are activated by surrounding negativity resulting in the possibility of moodiness and a troubled anxious scowl. If the mood deepens then so it seems does your stubbornness in addition to the likelihood to be hurtfully sarcastic. 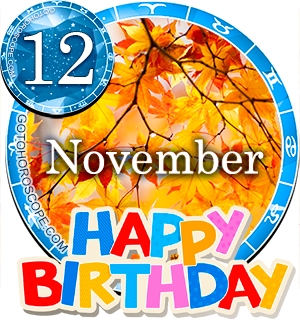 Being born on the 12th of November is destined to give you an avid keenness to get all of your talents recognized. You are capable of accomplishing amazing and worthwhile things with some positive thinking for motivation. To make desired aspirations possibly come true you need to believe strongly in your ability to succeed. Dreams are usually bursting with inventive thoughts and notions concerning current events. As you were born on the twelfth day of the month the one and two in your birth date add up to a Root number of Three. This numerical reference to your birthday has the keyword 'Innovation' signifying your craving for variety and frequent creation of original concepts. In a mystic Tarot deck the 12th card depicting the Hanged Man is associated with your birthday. This symbolizes your deep thought and spirituality plus it recognizes your inclination to know your limits and potential. The lucky gemstone for November the twelfth birthdays is an Amethyst to be worn for a possible sharpening of your intuition and a boosting of your confidence. The celestial body Pluto is believed to be the a big influence astrologically on the probable personalities of all Scorpio's. The actual day you were born on, the twelfth of November, is governed by Jupiter's reign slightly altering the probabilities of your uniqueness. Your perception, loyalty and cheeriness make you caring, mindful and so lovely to know. Your optimism and slight perfectionism assist in keeping your spirits high the majority of the time. If you can manage to find a method of conquering anxious moments your usual moody responses should diminish considerably. A completing thought for people born on November the 12th is to aim to nurture your incessant thirst for knowledge as its resulting wisdom should serve you well throughout life. Diz is me in a word may b...!! Everything about being sarcastic and insecure emotionally sounds quite accurate lol. Definitely not lucky in romance. While I do not believe in astrology, and never read my horoscope, the description of a Scorpio does fit me, and the Nov 12th description is perfect. As far as the whole soulmate thing, I think if we are lucky, we experience it once in a lifetime and if we have, we will never find that kind of connection again, which is why I spent 40 years with the wrong person. I am again seeking, but it is very hard. We are so giving and caring and wear our hearts on our sleeves and almost always end up hurt! What a shame, since of everyone, we perhaps have the MOST to give and others do not see it. Wishing you all the best. My birthday being 11/12/76 has given me about 40 years to figure out that my opportunities & constraints in life are relevantly grouped in cycles. Methamorphis is prevalent in those on this day. Because we feel so deeply and exist emotionally charged as we do, we can not possibly exist to succeed if there is no reference in our life of truly failing either. How else those born on this day know the depths of darkness and yet shine so britely in the light. Because we are naturally intellegent it is easy to fool ourselves and the world that life is less than what we make it to be. We are simply capable of great evil & great goodness by default of having an above average emotional intelligence, therefore psychopathic tendacies can be assisting in our thought process as a belief system. Our gifts can be easier accessible if we truly see with our eyes and if we truly feel with our hearts. And yes, everything about this day is exactly true for me down to the last word. Lol. Let live & Happy times Scorpios. I truly understand what you are saying,ithink our loyalty to a person or persons is the problem and that's why we hurt so much.We love and devote ourselves to a person and what we get for it disloyalty. I think we need to be more carefree and make ourselves happy and stop trying to make others happy. My birthday is 11/12/83 and I too have had my heart shattered and I am sure I have done the same to others sadly. Don't become a cold blooded criminal just yet. I honestly believe that us Scorpio 12 people are here to bring light into people's lives by any means necessary. That's why we feel so much hurt and pain, however; can anyone else do what we can? Nope, thus making us very rare and we have to be responsible for all this power the universe has bestowed upon us. Yes, it is a burden; but we are here for a reason! You are so right! I'm a December 16th Sagittarius (which basically means I am more emotional/sensitive than other Sagittarians). I have been dating my November 12th Scorpian for almost three years now and when I have my dark days, he lights up to my path. No one has the emotional strength he does and I can't believe how lucky I am to be with someone like him. Keep positive and know you are here to be a light! You guys are awesome! wow Kathy I'm November 12th and he's December 16th he's not emotional, loves outside women , have the hardest time being faithful and what tops it off he's close to 60. I agree with most except for the exercise part! I am an avid gym go-er! Definitely very motivated but have a hard time finding a mate that I can feel passionate about. I want a deep conversation and everybody I meet is dull. everything abt it is referring to me, it looks like someone talking abt everything i do. Its my birthday too, Almost everything is accurate for me. Almost! Around 85% mentioned above. Thanks for this ! This is my birthday and my love life and husband is AMAZING! Emotional and spiritual fulfillment are my mainstay. of course, I'm a Christian, so that supersedes astrology. Worship the Creator, not the creation. Having said that, I think there is some uncanny relevance to this--but it can also be misleading, which is why the Bible warns against it. I am 64 and have not met my soulmate... Another life perhaps. TO SMILE WHEN. REALLY. MY HEART FEELS LIKE MY POOR HEART IZ NOT GOOD ENOUGH. JOUCH! is that true that we are unlucky in luv? Im too busy in deffense mode cause thata all i know so when. She komes in i SNAPP!